If like me you have quite a few SD cards, SIMS and thin USB drives to organise you might be interested in a new affordable organiser called the CardGear Duo which is now available via Kickstarter priced at just three dollars for early bird backers. If the project reaches its pledge goal shipping is expected to take place during December 2017, check out the video below to learn more about this minimalist, compact yet ultra-versatile cardholder which is perfect for travellers and photographers. Solidfirst the creators of the CardGear Duo explain more about its inspiration, design and Kickstarter campaign. In the beginning of 2017, we launched a project called CardGear Slim. Thanks to our supporters, the project was funded. 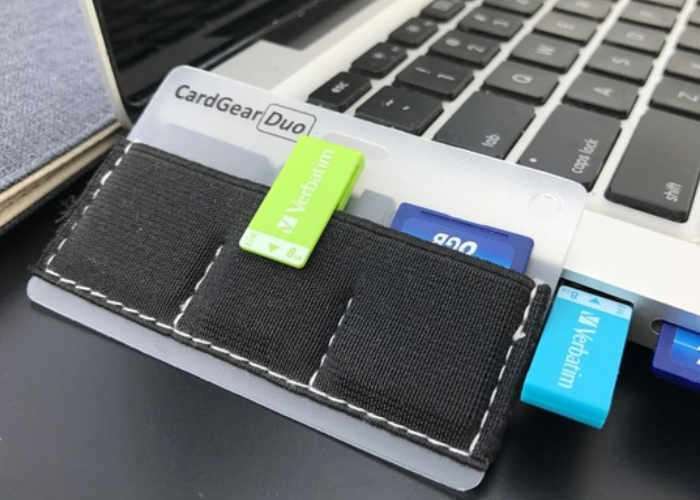 Because of the high demand of the SD Card holder version, we have created this project “CardGear Duo”. It is a SD card and USB holder. We really like this project and think everyone will like it too. CardGear Duo is perfect for photographers who have many SD cards and carry them also everywhere they go. CardGear Duo is also great for most of us who like to carry mini USBs between work and home. CardGear is a unique product that was never produced before. We learned so much in the last CardGear project and was able to manufacture and deliver it. Since the manufacturing and handling of CardGear Duo is similar to the previous GardGear project. We do not expect any difficulty in producing CardGear Duo. Also, as you can see, we have a working prototype. In this stage, we have completed the development of the project. We are confident to make CardGear Duo another successful product and confident that we can deliver this project to every backer.